Aztec tattoos have since time immemorial inspired tattoo artists to design enigmatic Aztec tattoo designs on men who belong to the rich and vibrant Mexican race or others like Meso American people. Such is the charm of Aztec tattoos that even non Mexican men and women crave for getting the famous Aztec tattoo designs inked on various parts of their bodies. If one were to dig deep into Mexican civilization, he would have to search the vast treasure trove that Aztecs preserved for their successors, and Aztec tattoos form an integral part of that treasure trove. Aztec tattoo designs are unique in style and appearance. An Aztec tattoo will never be carved without symbolizing something that makes these tattoo designs have a distinct style. Most Aztec tattoos will portray a god. Some of these tattoos look simple with just the face of a god or the head carved. In more elaborate forms, an Aztec tattoo would be inked together with many other intricately designed motifs like calendars and animals. As we know that Aztecs were a warrior race that believed in the power of a warrior’s strength and hence most of these Aztec tattoo designs are carved around the central theme of a warrior, whether a male or a female. Some of these designs are accompanied with other motifs like an eagle, skull and feathers. Each Aztec tattoo as designed today by various tattoo artists looks distinct and still retains its originality. While the world is going bonkers over modern tattoo designs, it is the enigmatic Aztec tattoo as I would like to call it that catches the attention of people that cherish and respect art and artistic pursuits like getting an Aztec tattoo. Some of the most commonly seen Aztec tattoo designs are those that involve the use of animals like snakes, dogs and jaguars. There is a reason why such animals occupy an important place here. The Aztecs believed that such animals were their spiritual guides and symbolized power and other qualities. The post here depicts various types of Aztec tattoos, each having some meaning. If you look below, you would find many eagle Aztec tattoo designs that symbolized a powerful position enjoyed by a warrior. People with such eagle tattoos would generally flaunt an elaborate costume of a warrior who is shown wearing an eagle shaped headdress. Skulls too are commonly inked and these signify death. Apart from these, there are flower Aztec tattoos and serpent tattoos that are considered quiet popular among men. The sun Aztec tattoos as seen below look amazing and are perhaps the most demanded as these look very artistic and have a peculiar attractiveness that appeals senses. There are also motifs of a god with its tongue out and this resembles a sun Aztec tattoo but it is not so. 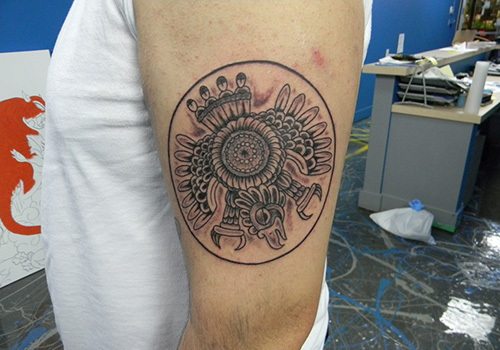 Among all the types of Aztec tattoos, the tribal Aztec tattoo designs are carved using just the color black. For others, various vibrant colors like reds are used to bring in energy. All of these Aztec tattoos have an illustrative look and are spectacular. Such is the beauty of an Aztec tattoo that it can be carved anywhere on your body. If you need it to be seen, you can get it inked on your biceps like most men do, or the back of your body too can look masculine with a cool Aztec tattoo. Full back Aztec tattoos cover the whole back and look splendid. For those that want a small Aztec tattoo, they can ink it on their foot or neck. Look at the 50 images shown here and if you like some get one of these soon.